A tireless traveller, Paul Signac painted his entire life, using oils and watercolours, taking ports—whether sea or river, traditional or industrial, in France or abroad—as his subject. In 1929, at the age of 65, having gained recognition and fame, he was finally able to fulfill his lifelong dream of painting watercolours of 100 ports of France. This "Ports de France" series, executed from 1929 to 1931, was the crowning achievement of his career as a watercolourist. Just prior to 1929, Signac made acquaintance with a businessman by the name of Gaston Lévy, founder of the Monoprix store chain and avid collector. The two men immediately formed a strong friendship. Signac told his new friend about his plans: "I will paint two watercolours in each port, one for you and the other for me. They will be different, and you will choose the one you prefer." Gaston Lévy saw the appeal of the project and immediately accepted to sponsor his tour of France. These watercolour chronicles of the "Ports de France" gave Signac the opportunity to demonstrate the breadth of his talent. As he journeyed from Dunkirk to Biarritz, from Menton to Port Vendres, Signac recorded his love of the skies, water and sailboats. As he moved from the industrial ports of Saint-Nazaire and Dunkirk, and the military ports of Toulon and Brest, to the tiny fishing harbours of Brittany and the Mediterranean, the passage of time could be seen in the cool or warm tones of the changing seasons. Charting his love of the sea with a personal and sensitive touch, Signac provides us with a map of the French coastline. 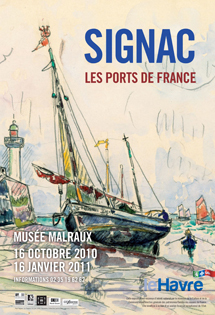 The exhibition is the first to display so many watercolours from the "Ports de France" series together. Hailing from major private and public collections (particularly the James T. Dyke collection donated to the Arkansas Arts Center in Little Rock), all of the approximately 80 pieces known to date are examined against a selection of paintings by the artist demonstrating his deep attachment to the sea and ports, as well as several historical works that inspired him for the series (Le Lorrain, Joseph Vernet, Corot, Jongkind, Boudin). This exhibition is recognized as being of national interest by the French Ministry of Culture and Communication.